Like people, sometimes work zones must be on the move. Rather than remain fixed to a single location for an extended period, these project areas migrate from one spot to another in a series of incremental relocations. Because of this ongoing movement, these short-term projects have earned the name mobile work zones. Understanding the importance of these ‘pick-up-and-go’ projects, Roadway Construction Service has developed highly-responsive mobile traffic control services. Short-term work zones are divided into two types. The continuously-moving zone changes locations as specific work is completed. Tasks that fall into this category include pavement marking and street sweeping. Intermittent work zones, on the other hand, involve very quick stops along a given route. Patching potholes and picking up trash are among the actions that come under this heading. In either case, providing suitable temporary traffic control for these two situations demands super-responsive reflexes. Mobile work zones clearly are distinguished from long-term projects that may last days, or even weeks and months. 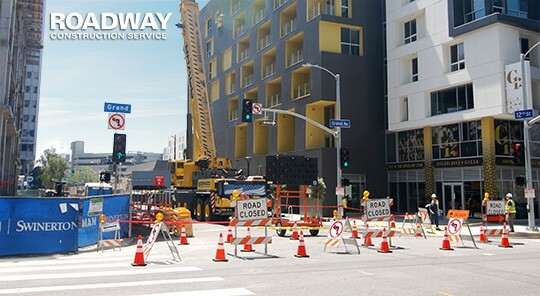 Because of this clear-cut difference, Roadway Construction Service manages these unique projects by crafting specialized traffic control strategies for short-term assignments. These strategies take into consideration a wide range of factors, including road conditions. An out-of-the-way road with relatively low traffic volume requires less stringent safety measures than a busy metropolitan highway. Our team has the know-how to deal with each condition, thereby providing maximum protection to workers, pedestrians, and motorists. Mobile traffic control depends on two basic components to maximize work zone safety and efficiency. The first of these is the people component. For this, flaggers play a crucial role. This core group of experts is responsible for maintaining the smooth flow of traffic, as well as the overall safety of their assigned work zone. Therefore, they must be proficient communicators, as they supply crucial information to everyone in the vicinity – from fellow crew members to passing motorists and pedestrians. The tools at their disposal primarily are hand-signals and signs. These must be handled with precision and care – the safety of virtually everyone in the vicinity depends on it. To ensure they’re up to the task, our flaggers receive intensive training that qualifies them for the highest certifications, including OSHA. Complementing the protective powers of our traffic flaggers is the traffic control equipment and devices we supply to every mobile work zone. This includes an assortment of barriers designed to prevent the accidental intrusion of vehicles into restricted areas. As with the work zones, the barricades employed must be easily moveable. Lightweight and compact are two characteristics that define these barriers, with plastic barricades a natural choice to ensure the needed mobility. It’s interesting to note that while short-duration and extended-duration work zone projects have different requirements, there is some commonality between the two. Both types of roadway work operations divide a project zone into four basic areas: advance warning, transition, work, and termination. There are, of course, definite differences in how this four-stage structure applies to short-duration and extended duration work zone projects. Nevertheless, the basic principle remains the same for both. Clearly, reliable mobile traffic control solutions are vital for the success of short-duration work zone projects. For this reason, Roadway Construction Service focuses considerable attention on this component of our operations. To learn more about our road traffic control, reach out to our team any time at (855) 907-7233. We’ll be happy to provide additional information and answers to all your questions.